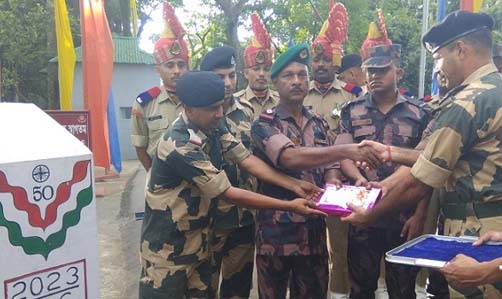 The 47th Indo-Bangladesh border co-ordination conference, which is a director general level talks between Border Security Force (BSF) and Border Guards Bangladesh (BGB), began in New Delhi on Monday. India is taking up issues like BSF personnel being attacked by Bangladeshi criminals and those related to cross-border smuggling. The two sides also shared updates about the movement of Rohingyas in their respective jurisdictions. Earlier, a 13-member delegation of the BGB, led by its Director General (DG) Maj Gen Md Shafeenul Islam, arrived in the national capital on Sunday as part of their six-day tour. The 13-member Border Security Force (BSF) side will be led by DG K K Sharma. The bi-annual meeting comes at a time when relations between India and Bangladesh are at an all-time high. Issues related to border infrastructure, simultaneous coordinated patrol in vulnerable areas of the border and mutual sharing of information are also on the BSF agenda. The BGB are taking up issues like smuggling of various types of drugs/narcotics from Bangladesh and arrest or apprehension of Bangladeshi nationals by the BSF among others. A joint record of discussion will be signed between the two forces on September 7. Notably, DG level conference between the two neighbouring countries began way back in 1975. The last time the two border forces of India and Bangladesh met in April early this year in Dhaka.